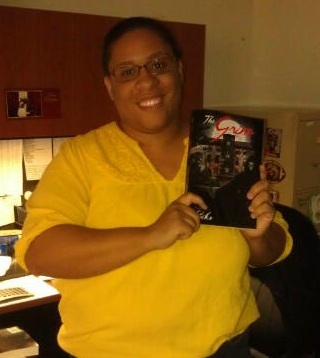 I can’t believe it’s already been FIVE YEARS since the release of my debut novel, The Grim. It’s the story of Jacinda (Jaycee) Baynes, a young single mother convicted of the second degree murder of her ex-boyfriend and father of her child. Sentenced to confinement at an intensive inpatient psychiatric facility, Jaycee suffers from severe PTSD (that’s post-traumatic stress disorder for you lamens), and sees the ghostly hallucination of her captor everywhere. After five years, I did a solid reread of my first ever full-length novel. I am both impressed (with my storytelling) and disappointed (with the strength of my writing skill). I can see very clearly my cringe-worthy beginner’s mistakes, and I wish very deeply at times that I could rewrite, revise, redo–all those RE’s–and give Jaycee the clean-scripted narrative she deserves. Those of you who have followed me from the onset though don’t seem to want any changes. You love Jaycee and her story just the way it is. Jaycee, in part, is a fictional representation of my own story. In the last five years, Jaycee has given me the voice and courage to finally write that story, a memoir presently titled Heart Fire, which I hope to be able to share with you soon. In a sense, it will be the sequel fans of The Grim have been begging for these last few years. Because, you see, Jaycee, in so many ways, is really me. So, I guess this post is here to say thank you for everyone who has followed Jaycee’s struggle and to mark a phenomenal five year journey with a fan base that has been nothing but awesome the entire way. Bless you all, and here’s to many more markers of what I pray continues to be a bright and creative future. I had planned to share some more really good poetry with you today, but as it turns out, I’m interviewing with an author friend of mine, Chicki Brown, on her blog. So why don’t we detour there instead? I think you’ll really like it! Also, if you haven’t already, check out the Chapter One preview of The Grim. I received my first copies of the novel in yesterday, and I must say I am absolutely thrilled! I can’t wait for all of you to settle in your window seats, recliners, or your favorite nook with a copy of my book. I just know you’re going to enjoy reading it as much as I did writing it. Enjoy your day and the interview, and I’ll be back on Monday with more great poetry! This month is National Reading Month! 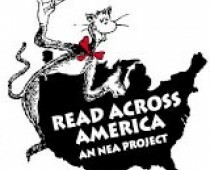 This particular celebration is usually geared toward encouraging young readers to pick up a book (as Dr. Seuss’ birthday was March 2), but, as an author, I feel it should highlight adult reading as well, which has also started to dwindle. However, the age of Kindle and Nook has certainly rejuvenated book sales in the States, but has largely affected the sale of print books from traditional brick and mortar stores. As my young man turns 10 today, being an avid reader, I want to celebrate some of the Young Adult series he loves to read. My son has loved dinosaurs since Pre-K. He owns every Land Before Time film, has about a dozen Fisher-Price robotic dinosaurs (which he still refuses to give away) and about a gajillion dinosaur models ranging from metal nuts and bolts to plastic glow-in-the dark. As he has gotten older, he branched off into paleontology as a whole, eager to discover new things and dig up new finds, determined there will be a dinosaur named after him–one day 🙂 That being said, it’s no wonder he solicited his aunt, a navy sailor stationed overseas, to get him the Astrosaurs series. 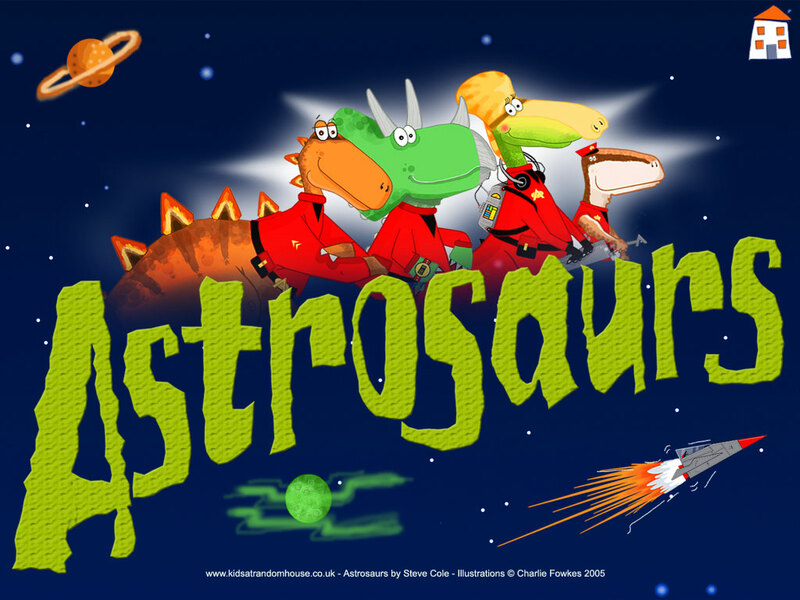 Written by Steve Cole, a British author in London, the Astrosaurs series tells us that the dinosaurs never actually went extinct. Instead, they escaped the earth in space pods and now live in the far reaches of outer space. The series follows a young group of new Academy graduates, ambitious and anxious to prove themselves to the Alliance as they battle wayward meat-eaters around the galaxy. The series is pretty entertaining with colorful character collectors cards perforated in the front. I would recommend this series for dinosaur lovers ages 8 and up. If you have younger readers, the books are funny and wonderful for reading aloud. Another favorite pastime my son enjoys is origami as he loves to make “creations” out of just about anything; he sees something miraculous in every empty bottle, straw wrapper or piece of useless paper. So it’s no wonder that at his school’s book fair this year, he got hooked on a new series by Tom Angelberger called Origami Yoda. This series is hilariously delightful. It follows a young nerdy kid who finds a way to origami a Yoda finger puppet in class. While what Yoda’s host has to say usually makes little sense, Yoda himself seems to be giving everyone exceptional junior high advice. 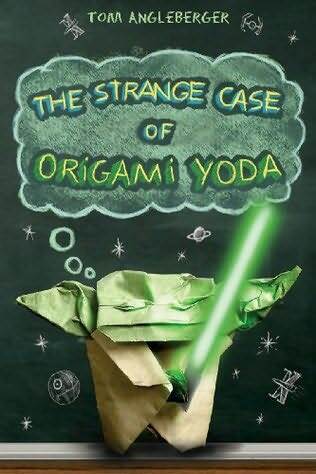 There are two books in the series currently, The Strange Case of Origami Yoda and Darth Paper Strikes Back. 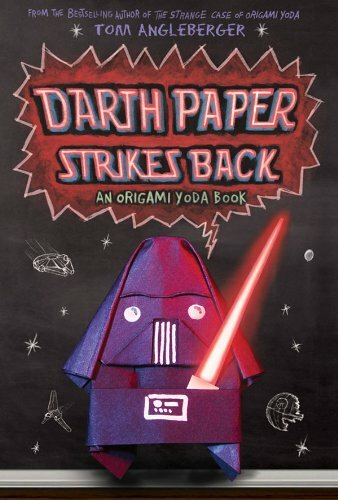 Each book gives step-by-step instructions on how to origami both Yoda and Darth Paper respectively. (There are several versions of each of these littered about my house.) A third installment to the series will feature a new Star Wars related character whose identity has not yet been released. 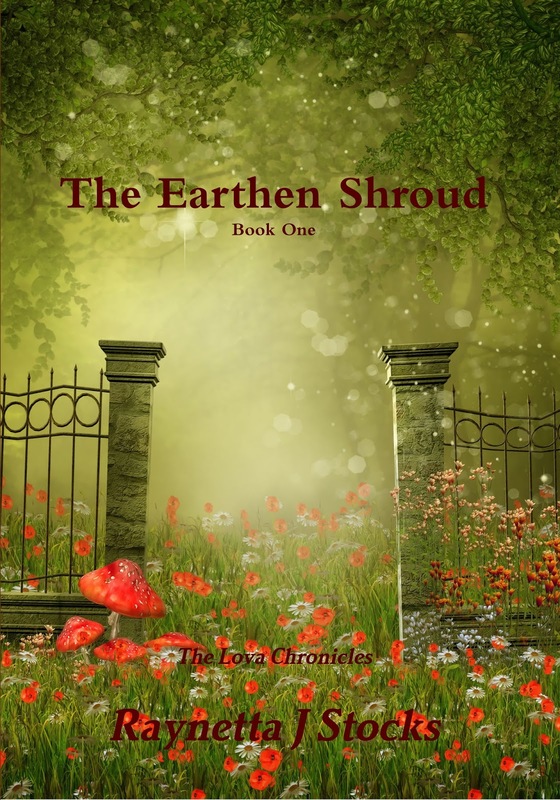 The name of the third book is slated to be announced March 29th. I think this series is absolutely wonderful! Chock full of kid-friendly, laugh-out-loud humor and pretty clever advice, I think your young reader will find this series an incredibly fun read. For his birthday today, my son received a Barnes & Noble gift card. Instead of engaging your young ones with video games and toys, please encourage them to read. Let them see you reading, visit your local library and participate in their functions and activities. It will foster not only a love of books, but of imagination, vocabulary, and discovery. I promise, an avid reader is definitely a trait to you’ll want under your child(ren)’s belts. Check out the books I mentioned and happy reading!